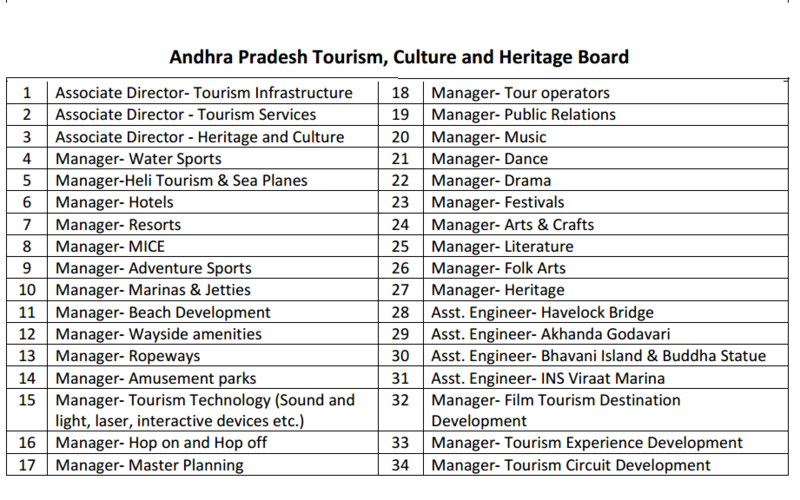 Andhra Pradesh Tourism invited applications for recruitment to 34 Director, Manager & Engineer Posts. The candidates eligible for the post can apply through prescribed format on or before 23 November 2016. Andhra Pradesh Tourism Job Notification: Andhra Pradesh Tourism invited applications for recruitment to 34 Director, Manager & Engineer Posts. The candidates eligible for the post can apply through prescribed format on or before 23 November 2016. Educational Qualification for Associate Director Post: Graduation in any stream with PGDBM/ PGDBA/ MBA from a leading, recognized college/ institute. Interested and eligible candidates are required to Applicants are requested to send their detailed CVs in WORD or PDF format to tourism.careers@ap.gov.in with the subject line clearly mentioning the position applied for. CV should contain the experience and education details along with expected remuneration and references (with contact details).